Build you a financial investment decision-making process. We believe long-term, intelligent asset allocation is a far better investment approach than trying to pick a single company that may outperform its competitors. 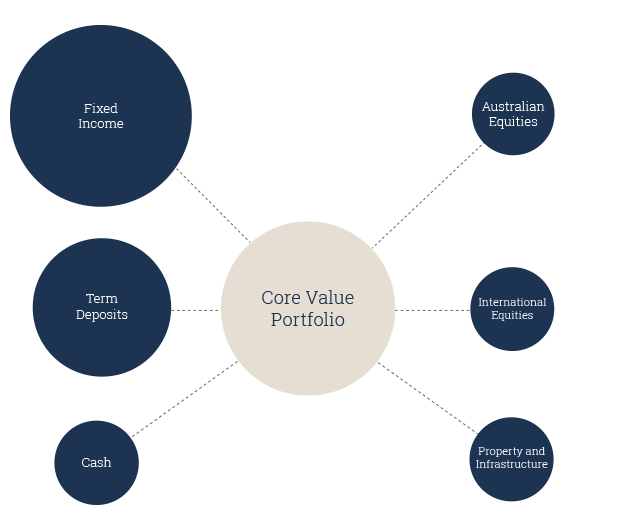 Our expert investment team use a broad range of assets to build sophisticated, globally-diversified portfolios. 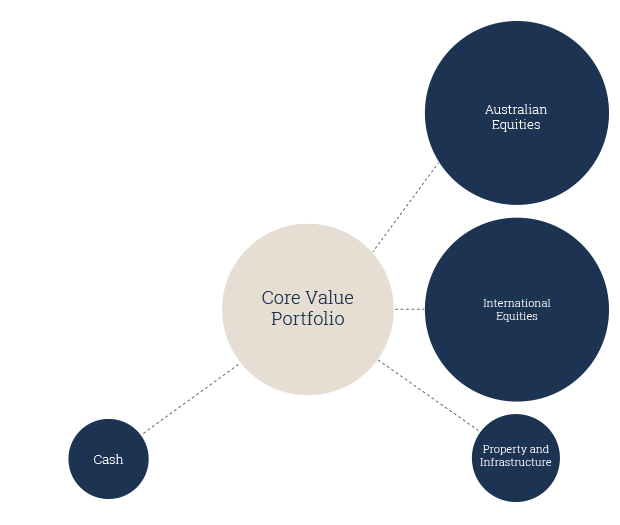 Our approach is guided by esteemed Australian Investment Professionals with over one hundred years of experience and backed by Nobel Prize winning research. By bringing innovation together with intelligent portfolio management we aim to grow and protect our client’s wealth to help them reach their financial and lifestyle goals. 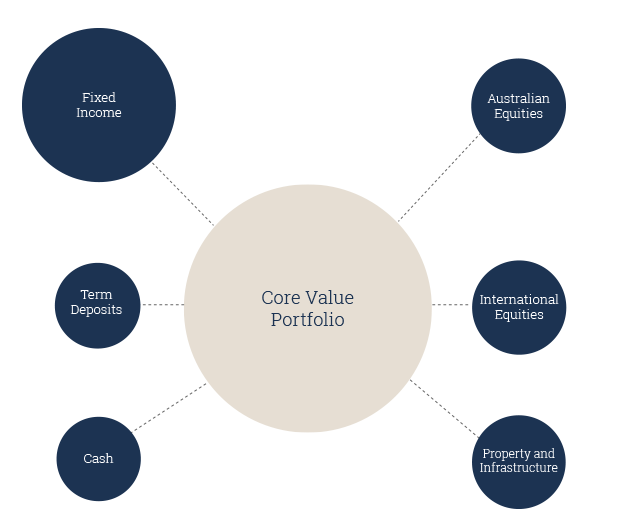 Investing across a mix of assets classes that have attractive risk and return characteristics and are sufficiently robust to withstand varying economic and market conditions is a key tenant of smart investment. We focus on building high-quality, diversified investment portfolios so all your eggs aren’t in one basket. No two investors feel the same way about volatility. Some take a long view and are unperturbed by the market’s ups and downs. Others are more cautious but are willing to take calculated risks. Through straight talk and careful planning, we’ll guide you to an asset allocation that reflects your risk tolerance as well as your objectives. A Core + Satellite approach to portfolio construction uses passive index funds/ETF’s as the stable “core” of the portfolio, with carefully selected, lowly correlated active investments as the “satellites”. 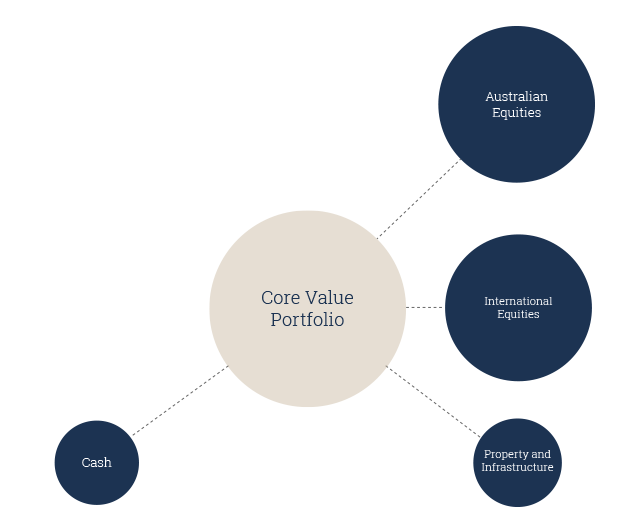 This approach brings greater discipline and stability to an investment portfolio through reducing volatility over the market cycle whilst providing greater portfolio diversification and reducing overall management and transaction costs. Managing and reducing investment costs and taxes is a key pillar of our Investment Management process. Ensuring that costs are relative to value delivered is one of the main differentiators in determining long-term returns . Our portfolio construction process focuses on how to minimise investment and management costs whilst delivering strong risk-adjusted returns over the long run. Our investment process starts with you. We want to understand your goals – the reason you’re investing. We look at what you are trying to achieve and build a strategy around risk, investment structure and time frame. Goal based investing is proven by research to improve investment outcomes by encouraging optimal behaviour and more precise wealth management. We understand that no two investors feel the same way about risk. Some take a long view and are unperturbed by the market’s ups and downs. Others are more cautious but are willing to take calculated risks. By learning about your goals and building a roadmap, we’ll guide you to an asset allocation that reflects your risk tolerance as well as your objectives. Life and the financial markets have something in common: change. That’s why it’s essential to follow a well-defined process. We’ll monitor everything that can affect your investments — and we’ll make adjustments as needed. We understand that everyone is different, which is why we’ll build an investment solution that ensures you are on the right track to meet your goals. We’ll meet with you regularly and offer monthly investment insights to ensure you understand not only the markets but how they affect your investments as we keep you on track to achieving your long term goals. The EFS Strategic Investment Team has extensive experience in macroeconomics, market analysis, and risk and security selection across a wide range of investments. 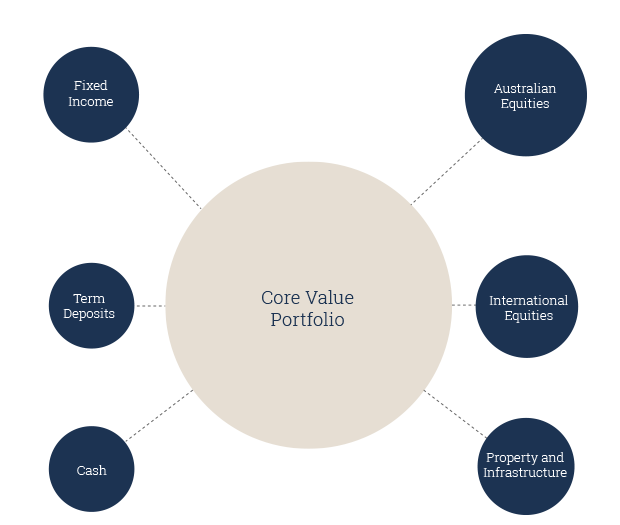 The team is run by our Chief Investment Officer, Brad Matthews, who has over 25 years’ experience in devising investment strategies for clients ranging from SMSF’s to high net worth individuals. Our Investment Team meets regularly to assess opportunities and risks across global markets, and set appropriate asset allocations and investment strategies for our clients. They look beyond cash and shares to ensure an array of choices are available to complement both your existing portfolio and the dynamic nature of changing markets. NOTE: These Investment Portfolios are for illustrative purposes only. The amounts of funds that your adviser will recommend will be determined after your situation has been fully assessed and elements such as your tolerance to risk and income / cash flow requirements are considered.